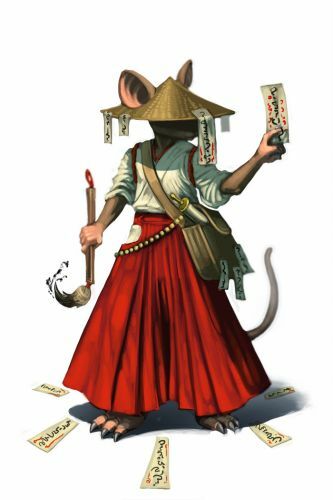 Whisked from the Dojo at great personal risk to the King’s servants, the Sacred Shrine mice spent most of their days before the gauntlet protecting their shrine from evil spirits and performing exorcisms for the folk in outlying regions. Their prayer slips burn the impure with the power of sacred flame, and form a ring of protection around them. One prayer slip, properly applied to a trap, can release the spring without a touch. The Sacred Shrine Mouse is attracted to Gauntlet Cheese Tier 6. No Charms are required to attract the Sacred Shrine Mouse. Hunters can encounter the Sacred Shrine Mouse only in the King's Gauntlet location when hunting in Tier 6. The Sacred Shrine Mouse drops Gauntlet Potion Tier 7 as loot. 8 June 2010: The Sacred Shrine Mouse was released with the introduction of the King's Gauntlet as part of the MouseHunt v3.0 update. 5 July 2010: The King granted permission to use the Gauntlet Potion Tier 6, allowing Hunters to access the Sacred Shrine Mouse. This page was last edited on 19 February 2018, at 01:34.